Good news for the trolleybus! On 15th July, VBZ announced that it is acquiring 33 new trolleybuses. Of these, 16 will be single articulated and 17 double articulated. The new trolleybuses will replace the first generation of Mercedes Benz / ABB 0 405 GTZ units (35 in total). The chosen supplier is Hess AG (of Bellach SO, Switzerland) with electrical equipment from Vossloh Kiepe GmbH (of Düsseldorf, Germany). Deliveries will commence in mid 2006 and be complete in early 2008. Double articulated trolleybuses are a premiere in Zürich. A Genève vehicle visited the city last year for trials, but did not run in service. It toured the system at night to check clearances and the aptitude of the power supply. The double articulated units are primarily intended for the chronically overcrowded route 31, but the infrastructure of route 32 is also being adapted to permit some flexibility in deployment (on both routes modifications to the stops are needed). The double articulated buses will be able to carry 35% more passengers than the current trolleybuses, translating into savings of 570,000 Franks annually. 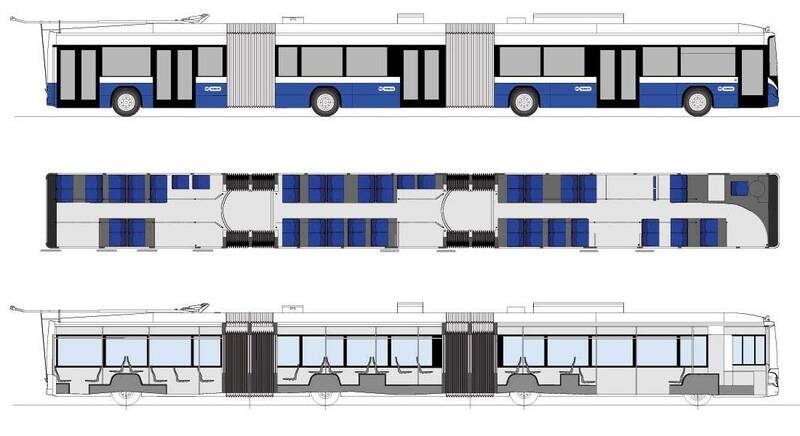 Further trials with a double-articulated trolleybus will take place on route 31 from January 2006 — this time in passenger service (presumably a Genève vehicle is being borrowed again). In the unlikely case of it proving unsatisfactory, the order will be changed to a larger number of single-articulated trolleybuses. The double-articulated units are scheduled to be delivered from mid 2007. Besides Zürich and Genève, St. Gallen is also investing in double-articlulated trolleybuses. In contrast to these cities, however, the St. Gallen units are being created by rebuilding older vehicles. All three orders have been secured by Hess. The single articulated units for Zürich and Genève are of type Swisstrolley3 and the double articulated units lighTram3. Genève is taking 38 and 10 units respectively. See also: VBZ to order new trolleybuses (26.02.2004). Associated links: Vossloh Kiepe, Hess, VBZ, Pro Trolleybus (Basel), Trolleybusverein Schweiz, Trolleybus Yahoogroup.